Pathway Lending offers low-interest commercial loans to businesses and nonprofits with facilities in TN to make energy efficiency improvements such as lighting, cool roofs, and HVAC upgrades. The loan program has financed over 200 energy efficiency and renewable energy projects ranging from $20,000 to $3,000,000 since its inception on 2010. Visit pathwaylending.org/energy-efficiency-loans<https://www.pathwaylending.org/energy-efficiency-loans/> for success stories and program details. The Alliance to Save Energy promotes energy efficiency to achieve a healthier economy, a cleaner environment, and greater energy security. Here you will find the latest information on Policy advocacy, research, education, technology deployment, and energy security. ACEEE is a non-profit, 501 (c) 3 organization, and acts as a catalyst to advance energy efficiency policies, programs, technologies, investments, and behaviors. This organization specializes in Energy policy at the Federal, State, and Local levels, Research, and Outreach through publications and conferences. The Chambers for Innovation and Clean Energy (CICE) is a national network of over 350 chambers of commerce dedicated to helping chambers and their member companies successfully navigate and prosper in the clean and efficient energy arena. Additionally, the CICE network provides a forum for local chambers to connect and deliver enhanced value to member businesses. Team Green Zone is a Founding Member of this organization, bringing its national resource to Memphis and the Mid-South community. DSIRE is the most comprehensive source of information on Incentives and Policies that support renewables and energy efficiency in the United States. This site provides an unofficial overview of financial incentives and other policies according to each state, including Tennessee. EnergyStar is a U.S. Environmental Protection Agency voluntary program that helps businesses and individuals save money and protect our climate through superior energy efficiency. Among the resources EnergyStar offers is a step by step informational kit to guide businesses through an Energy Efficiency project. LED Lighting Facts is a program by the U.S. Department of Energy that showcases LED products for general illumination from manufacturers who commit to testing products and reporting performance results according to industry standards. This site will help you find LED products that have been thoroughly tested and approved for use. It is also your source for lighting information as well as information about the LED industry. The Department of Energy's mission is to ensure America's security and prosperity by addressing its energy, environmental, and nuclear challenges through transformative science and technology solutions. The Green Globes Building Rating system is a revolutionary building environmental design and management tool. It delivers an online assessment protocol, rating system and guidance for green building design, operation and management. It is interactive, flexible and affordable, and provides market recognition of a building's environmental attributes through third party verification. SEEA brings together private interests, utilities, governments, public utility commissions, energy service companies, manufacturers, retailers, energy and environmental organizations, low income energy advocates, large energy consumers and universities to promote energy efficient policies and practices in the Southeast Region. Though education, programs and events, and membership outreach, SEEA helps ensure that energy efficiency is a priority in todays economy. The Tennessee Energy Education initiative provides training, tools, and potential funding options to help Tennessee Organizations take control of their energy usage. 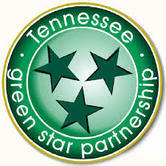 The Tennessee Green Star Partnership is TDEC's premier recognition program for businesses and organizations. The TGSP has three levels of advancement: One Star, Two Star, and Three Star Partners, with Three Star being the highest level of achievement. A business or organization can enter at any of the three levels, provided that the prerequisites and requirements of the lower levels are met.